For the second straight year, I had the good fortune to be able to attend the NLL Entry Draft since it took place in the Toronto area. 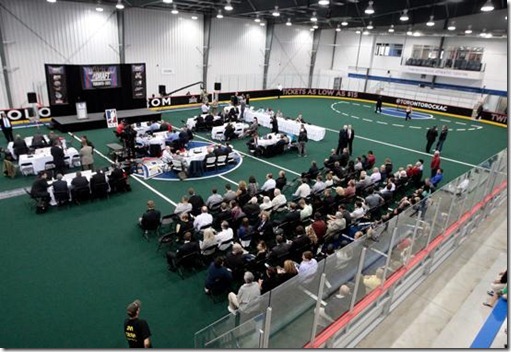 The 2012 draft was held at a hotel in downtown Toronto, while the 2013 draft was held at the Toronto Rock Athletic Centre in Oakville. This year’s location was even more convenient for me than last year’s since the TRAC is halfway to Toronto from my place. Again this year I will post my thoughts on the draft event itself, though I’m afraid I have little to say about the players drafted. I don’t follow the summer leagues or the MLL nearly as much as the NLL (and I don’t follow anything below senior lacrosse at all) so I just don’t know the players. If you’re looking for that kind of insight, head on over to IL Indoor or In Lacrosse We Trust. I realize the event was broadcast on the internet so many of you probably watched it happen, but since I didn’t watch the broadcast, I don’t know how much you could see or hear. The event took place on the floor of the carpeted rink at the TRAC. (There are two lacrosse rinks at the TRAC – one with turf and one concrete.) A stage with a podium was on the far side of the rink (in front of the benches), and nine tables (one for each team) were set up in three rows of three in front of the stage. To the left of the stage was a long table where NLL staff sat, including Commissioner George Daniel. To the right of the team tables was a line of tables for media, and to the left was a smaller table for hosts Andy McNamara and Stephen Stamp. The team tables were assigned in alphabetical order, starting with Buffalo at the front right, and going across and then back to Vancouver in the back row on the left. From left to right, the front row was Colorado, Calgary and Buffalo; the middle row was Philadelphia, Minnesota, Edmonton; and the back row was Vancouver, Toronto, and Rochester. Behind those tables were several rows of chairs for draft eligible players and their families. By draft time, those chairs were entirely filled. The stands were for the fans, though I don’t think there were more than about 30 people there, and I know a few of them were friends or family of the players. There were even a few people with media passes around their necks sitting in the stands. Last year, there was a combined seating area for players, family members, and fans, and I’m sure there were more people there than this year. I initially assumed there were just fewer fans this year, but maybe the players were told to try to limit the number of family members they bring since seating was limited, so that was the difference. I talked briefly to Stephen Stamp before the draft started, and he said they were having trouble with their internet connection through the TRAC’s wifi. My internet connection was working fine, but then I was connected through my smartphone. By the time the draft started, I imagine they got that all sorted out since I didn’t see anyone on twitter complaining about the broadcast. One thing I did notice though: Stamp was using a Macbook at the beginning of the draft – I assumed it was to bring up stats and information on players as they were drafted. But later on I noticed that the laptop was either gone or closed, so whatever information he had came from his memory. Unfortunately for me, there was an eight foot wall of plastic (how do I know it was eight feet? Because Dan Dawson could just see over it.) between me and the PA system so I couldn’t hear much. I could hear most of the player announcements, though a couple of times I had to wait 30 seconds and check twitter to see who was just picked, but as for the insight into the players, I picked up precisely none. The first few picks seemed to go as expected, with Logan Schuss and Jason Noble going first and second to the Swarm. After Colorado picked Dillon Ward, the Rush and Swarm made the first trade of the night – the Swarm sent Nic Bilic and the #5 overall pick to the Rush for the #4 pick. The Swarm picked Cameron Flint, and the Rush took Robert Church with their pick. It seemed odd to me that the Swarm felt moving up one spot was worth Nic Bilic, but I thought maybe they really wanted Flint and didn’t want to take the chance that the Rush would pick him. The Rush, however, had a jersey that already had “Church” on the back, so either (a) they had a few jerseys made up and grabbed Church’s when they picked him, or (b) they knew they wanted Church and made up one just for him. Maybe they felt getting Bilic from Minnesota was worth the possibility of losing Church, or perhaps they knew the Swarm wanted Flint and decided not to mention that they weren’t going to pick him. What’s even more strange about this whole thing is that Minnesota had the top two picks, but did not have a jersey for Jason Noble with his name on it. I don’t know if they had one for Schuss since he wasn’t there, but it’s not like the Swarm didn’t know who they were going to pick beforehand. They had jerseys made up for Sorensen, Matisz, and Jackson last year. After Edmonton chose Reid Mydske in the fourth round, I tweeted that he and his brother (Brett) would be playing for the same team. I joked “Checking to see if this has ever happened before.” I was surprised at the number of people who actually thought I was serious. People telling me about the Gaits, Powells, Selfs, Gajics, Dawsons, and even Squires. I’m sure I could come up with a bunch more without thinking very hard – of the top of my head: how about the Carnegies, Harnetts, and Malawskys – and that’s just Calgary (Derek Malawsky never played for Calgary but he and Curt played together on Rochester). Don’t forget the Sandersons (not Josh and Phil since they’re cousins, but Ryan and Chris on the 1999 Baltimore Thunder) (OK, that one I had to look up), Evans’s, Wrays, and Kilgours. This is not an uncommon thing in the NLL by any stretch. Anyway, back to the draft. By the time it was over, most of the fans had gone. There were exactly five of us left, and I saw Mark Matthews chatting to three of them earlier on so I guessed they were friends of his. I don’t imagine they’ll have the draft in the Toronto area again next year. Maybe if the league were based in Toronto I could see it, but the offices are in New York City. I think moving around the cities in the league would be good, especially for the western teams who’ve had to travel east two years straight. As I said last year, it was interesting to see the event happen live and watch “the inner workings of the league in action”, though I think I might have gotten more out of it by watching the internet broadcast. At least I would have been able to hear Andy and Stephen’s commentary. But then again, Toronto Rock first round pick Ethan O’Connor was sitting right in front of me, and it was very smile-inducing to watch him and his family stand up and hug each other when his name was called. You can see that on the broadcast as well, but it’s very different when you’re there in person rather than watching online. That alone made the trip worth it. ← The NLL Hall of Fame: Why is "not yet" an option?